The EU's top court has backed the right of a Greek Cypriot to reclaim land in Turkish-controlled northern Cyprus that has since been sold to a UK couple. Meletis Apostolides was one of thousands of Greek Cypriots who fled his home when Turkish forces invaded in 1974, following a Greek-inspired coup. The land was later sold to Linda and David Orams, who built a villa on it. 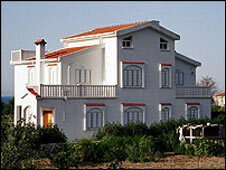 The European Court of Justice says a ruling in a Cypriot court that the villa must be demolished is applicable. Even if the ECJ ruling cannot be enacted because the land is under Turkish Cypriot control, it means Mr Apostolides will be able to pursue a claim for compensation in a UK court. It could also open the way for hundreds more Greek Cypriots to demand restitution for properties they were forced to flee. Many Britons and other foreigners have invested in property in northern Cyprus, despite the legal ownership still being in some doubt. Mr Apostolides said he was "very much" pleased with the EU court's ruling, and that it was "what we expected". He added: "This is a difficult issue that has to be decided by the courts." The European Court of Justice ruling on Tuesday said that the decision of a Cypriot court in Nicosia was applicable in the north, even though Cyprus does not exercise control there. It also said that one EU country - in this case the UK - must recognise judgments made in the courts of another. The Republic of Cyprus joined the EU in 2004. EU law was suspended in northern Cyprus for the purposes of Cyprus's accession, but lawyers argued successfully that the Orams' civil case still falls within the scope of the EU regulation. Northern Cyprus is self-governing and still occupied by the Turkish army, but is not recognised internationally. Nevertheless, it has become a thriving tourist destination in recent years, and house-building has boomed. Some of those houses have been sold by Turkish Cypriots to foreigners, even though the land they were built on was once owned by Greek Cypriots and its legal status remained uncertain. Property disputes dating back to 1974 have been one of the main obstacles to efforts to reunify Cyprus. Correspondents say dispossessed Greek Cypriots are now likely to launch more legal battles, which in turn may harden opposition to reunification among Turkish Cypriots.